The continuing development of this proposed program will be fueled through partnerships of Loving Garland Green members with other community groups such as Keep Garland Beautiful and Habitat for Humanity and City of Garland Departments such as the Neighborhood Vitality Department, our water department, our environmental waste department, our Parks and Recreation Department, etc. At the heart of this interconnected program are our public schools—their students, teachers and administrators and volunteers from our community. This program, when fully realized, will transform the school and its grounds into a literal urban agricultural learning format for the children against the backdrop of which they can learn science, math, art, history, conservation of resources, the importance of community and relationships with others, how to work together with others, and many more important life skills. We already have proof of concept for this program with the overwhelming success of URBAN GARDENS FOR KIDS. We are expanding this part of the program into a second series beginning April 10 which will involve several community volunteers and we are already moving forward under the leadership of Betty Roberts and members of Keep Garland Beautiful to build a butterfly garden together with the students at Beaver Technology Center-- a magnet school in Garland. Over the course of the coming year we hope to have all phases of this program in operation by the end of May, 2016 at the Beaver Technology Center here in Garland, Texas. That location is proposed to serve as the pilot model for this project. Our ultimate goal with this part of the program is to see the installation of a butterfly garden on the school grounds of every school in Garland ISD where feasible due to space and sunlight. There are many expected benefits to be derived from having a butterfly garden on school property in addition to the obvious purpose of adding beauty and providing a format for the students who attend the school to learn about the various life cycles of insects first-hand. A butterfly garden can actually be the first step to strengthening the micro-community that surrounds the school. This part of the program is still in its infancy. We have already advanced to this point: we have obtained permission from administrators at Beaver Tech to install a Butterfly Garden on their school grounds. Betty Roberts, current leader of Keep Garland Beautiful, and her team have submitted a grant proposal for funds for establishing a butterfly garden. It is expected that Keep Garland Beautiful and Loving Garland Green will work in partnership with other nonprofit groups as well as local businesses and city departments such as our Neighborhood Vitality group Department to build this butterfly garden. 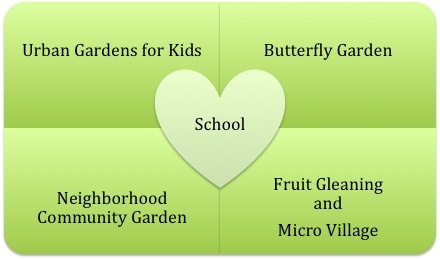 Part of the design of the Butterfly Garden Build will be the creation of a neighborhood group to be connected to the school. It is formed along the principles of "Adopting Your Neighborhood School". These neighborhood residents will also participate in these activities. We hope to have this garden installed by the end of May 2015 and a schedule set up for the neighbors to keep it watered over the summer. Over the coming months, beginning in mid to late May of 2015, members of Loving Garland Green (working with members of Keep Garland Beautiful and the Garland Neighborhood Vitality Department, school administrators and teachers at Beaver Tech) will create a neighborhood group for Beaver Tech. We will help the residents of this area to plan and build a community garden in a designated area of the school grounds. Perhaps we will bring them together with picnics on the school grounds and other social functions such as ice cream socials that bring the neighborhood onto the school grounds. We want to emphasize that our public schools belong to us all and as owners of this property, we share in the responsibility of helping to take care of it and see that this property is used to its fullest potential to teach our children. By the end of August, 2015 we will have at least four, 4' x 8' square foot gardens installed and planted with a winter garden on the grounds of Beaver Tech. During the fall session, the students will share the responsibility of caring for these beds with the neighbors. Beaver Tech offers many great opportunities for sharing urban agricultural activities with their neighbors. 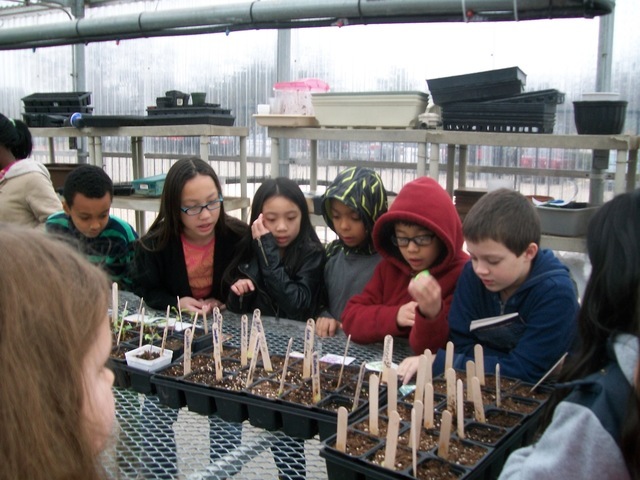 Neighbors and the students can plant a full winter crop of more delicate vegetables such as tomatoes and lettuce in the wonderful huge greenhouse that is located on the school grounds. Parts of this project might involve monitoring their crop productions to see how many people might be fed from their harvest. The possibility of lesson plans evolving out of these activities is almost countless. Building a micro-village is a project that members of Loving Garland Green, under the leadership of Anita Opel, have been exploring for about a year now. The basic concept is to build three tiny homes on a standard lot and landscape it with a central community garden. Parking would be on the periphery of the property. The residents of these small pocket communities would be connected by similar interests--for example a group of artists or a group of veterans. Introducing new ways of sustainable lifestyles or new ways of doing anything into any community always meets with strong resistance. And over the years, leaders of the status quo have often enacted laws and codes to ensure the ossification of what they believe is best. More often than not, it requires Herculean efforts to tear down these walls. I've decided that for this project it may be wise to follow the advice offered by the I Ching which basically advises to hold quietly at the center until the obstacles in your way have been tamed by the Higher Power--often difficult advice for me to follow. However, instead of head-butting directly with obstacles, sometimes the best solution is to walk around them. This aspect of the program would be a yearlong project beginning September 2015 and concluding May 2016 with the finished build of a tiny home. This project offers many goals and benefits for the students, the community and the school. For this part of the program, the students at Beaver Tech, with the assistance from members of Loving Garland Green, the teachers at Beaver Tech, neighborhood volunteers, and other interested people and businesses in Garland would build a tiny home on school property. During this process the children could learn first hand all the basics of what is involved in building a home by building this small model together. We could designate stages where tickets are sold for the public to view the progress. The money from the ticket sales might be needed to further production on the home and/or could be used by the school for other educational supplies. At the end of the project in May 2016 we would open the model home to a public tour. At this tour and prior to, we would sell raffle tickets for the home. The money from the sale of these tickets would perhaps go to support the continuation of all aspects of the urban agricultural program at Beaver Tech. The winner of the home would be responsible for hauling it off. Of course there are many other possibilities for the end-fate of this tiny home as well as the development of this project. I leave that up to Anita and all the wonderful volunteers from our community who step forward to work with her and the administrators, teachers and Beaver Tech students on this project. Fruit gleaning is the process of collecting fallen fruit from trees in the city that would otherwise go to waste. Many large metropolitan areas such as Toronto have organized citizens into these kinds of groups and have successful programs like this in place for several years. Members of these groups collect thousands of pounds of fruit each year. They sell this fruit to residents and distribute much of it to local food banks. This project is still in the formative stages. I'm hoping that we will be able to work with Beth Dattomo from Mayor Doug Athas' office on establishing this part of the proposed urban agricultural program for Garland. Beth works closely with the Garland Youth Commission. I'm not sure how we will move forward with this aspect of our program. 1. Location and Maps for Fallen Fruit - The core volunteer group locates places in the city where volunteers can gather the fruit (with permission from the owners) and creates maps with information regarding these sites (what type of trees, names of owners, etc.). Various contracts are worked out with the owners of the fruit trees. Some may not care to keep any of the fruit. Others may want take a portion of the harvest for themselves. Some trees may be located on abandoned property, or even property that is owned by the city. 2. Designation of a Distribution Center - This is the place where the gatherers bring the fruit for sorting, weighing and distributing. Here in Garland we already have a great possibility for this distribution center: the shed at 4022 Naaman School Road which is located on city property adjoining the licensed property of the Garland Community Garden that is stewarded by Loving Garland Green. Furthermore, if this space were designated as the distribution center for fallen fruit, we could install a gutter system on the roof and harvest almost enough rainwater from that one roof to water our entire community garden. Note: Although students from Beaver Tech could certainly participate in the Fruit Gleaning part of the program, I see this one as perhaps better undertaken by our Youth Commission and older youth of our community. Also, I would like to see our older youth working with some of the Beaver Tech students on building the tiny home. March 14, 2015 - Blackland Prairie Sampler was planted. Visit now to read about this new garden plot added to the Garland Community Garden and visit throughout the spring to check up on its progress. 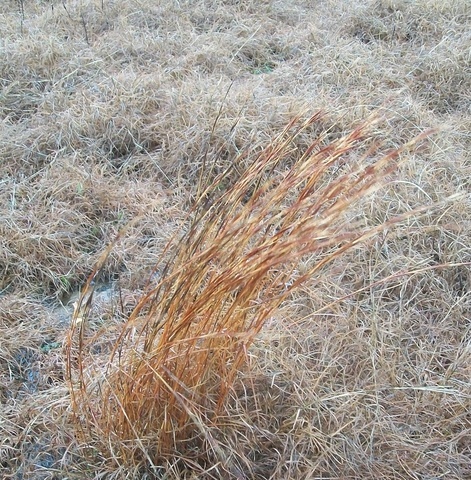 Nearby we will be planting a bed to demonstrate a buffalograss lawn. In the meantime if you want to see established Blackland Prairies you have two places in Garland to visit: The west side of the Spring Creek Forest Preserve has a Blackland Prairie Sampler beside their parking lot. 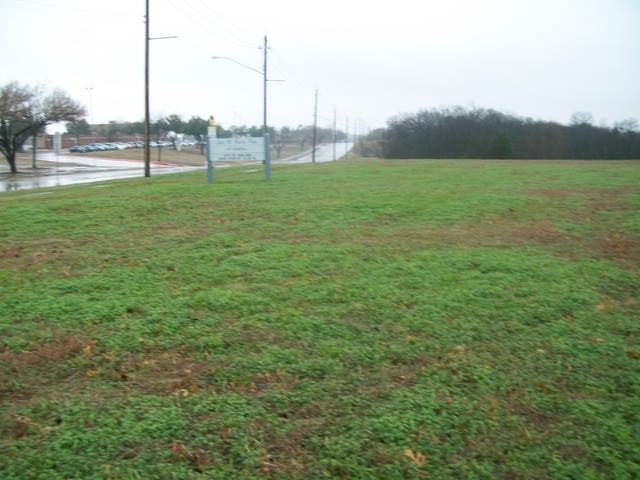 Rosehill park in south Garland on Country Club Road near the intersection of 66 (Rowlett Rd) and Country Club, just across the street from Lyles Middle School has a large expanse of Blackland Prairie. The Garland Community Garden is evolving into an interesting space. Our first year anniversary, April 12, is less than a month away. In less than a year we have grown from one 28 square foot bed to almost 3,000 square feet of garden beds. Like most new business entities (nonprofit and profit alike) our first year has been a bumpy road but somehow the garden and Loving Garland Green have managed to overcome all obstacles and continues to evolve. The garden often has its own unique voice that dictates to us how it will be and teaches us many lessons along the way. Even if we don't have all the answers, the garden can provide some of them for us. If nothing else, it slows us down and quiets our monkey minds so we can hear our hearts. When I go down there to work, or when I work in any garden, the best word I can find to describe the experience is simply Zen. Time falls away and I become one with the air and the earth. I know it may sound corny, but in our insane and often cynical world, most of the really good things like love do sound corny when we try to express them. That is why those of you who travel that part of the Naaman School Road corridor see me down there so often (the blonde little old lady). I'm down there in the garden because it is a grand place of contentment and happiness for me. A garden is also a great place to heal wounds of the heart. Watching things grow is a reassurance of the grand continuum of life. Gardens and especially the Garland Community Garden mean so much to me personally. That also explains why I'm such an evangelist when it comes to gardens. Because of our great public location and because we have no fences to keep people out, being in the Garland Community Garden is a great place to meet people. Most of the people who do stop, complete strangers, share so much of their life stories with me. It's amazing. If you are lonely and you want to meet people, come to the garden and hang out. They will be sure to show up. In the meantime you can enjoy the peace of the garden and listen to the music of the birds and the wind in the trees. Also, if you like, you can read the signs that are posted down there beside many of the beds. Perhaps the next time you visit you can bring a stone for the Medicine Wheel. A man and wife stopped by. They moved to Garland two weeks ago from Colombia SA. One of the reasons they chose Garland is because of DART. He is an American citizen, retired from the military who lived in South America for the past 20 years. He is needing some medical attention and wanted to be near the DART so his wife can easily get to and from the Vet hospital. His wife speaks little English, but is a gardener. They bought a home in south Garland and she wants to learn what plants grow well here. I speak Spanish--not as fluently as I should considering it was one of my minors in school--but I was able to communicate with her. I once danced the tango a lot and I ask her if she danced. Turns out she is a dance instructor. A man stopped by. He is an expert on Amaranths--a beautiful plant that I love but have not been very successful with growing. He offered to grow amaranths in our garden. Ray stopped by: One of the members of Loving Garland Green stopped by for a chat. I'm very interested in Ray's garden as he is installing a large aquaponic system in his backyard. Aquaponics is a great method for urban farming. However, I've tried this method and I prefer the connection with the earth. Ray has had such great success with two smaller aquaponic systems that he is expanding. Today I plan to drive over to his place and have a look. The mother of one of my students called me: Huong Le, mother of Jennifer, one of my students in the botany elective, Urban Gardens for Kids, that I'm teaching at Beaver Tech called me. Turns out she and Jennifer were driving by and saw me. Huong Le volunteered to come down with Jennifer sometime and work in the garden with me. Colby's Tomatoes Galore -- a coming attraction to the garden after Easter. Colby Clark, a Garland fireman and card carrying member of Loving Garland Green, currently has 150 tomato plants growing in his greenhouse. Approximately 30 of these plants will be transplanted to this large bed in the front of the Garland Community Garden. The bed will be divided according to three divisions: For Visitor Picking (only one tomato); For Food Banks; and For Colby Only. Since we have no fences (and we like it that way) we rely on the respect of those who visit the garden. Like life, the garden continues to evolve and change. I know there was an ancient philosopher by the name of Hereclitus who once wisely observed: "You can never step into the same river twice." I wonder if St. Fiacre, the patron saint of gardeners, ever observed that you can never step into the same garden twice. It's true. If you don't believe me, visit the Garland Community Garden today and then visit it two weeks later. Then you'll see what I mean. For example, who knows? In two weeks the tulips might be up. We see many gardens with statues of St. Francis. But Roman Catholic Church has deemed August 30 as the feast day of Saint Fiacre, patron saint of gardeners. Europeans, who have recognized Fiacre as the patron saint of gardeners since the Middle Ages, celebrate this day with special masses, floral processions and pilgrimages. In France, special floats of elaborate floral arrangements make their way down flower petal-covered streets. In Ireland, citizens sing hymns written in Fiacre's honor. Colby's Tremendous Tomatoes--Coming Attraction to the Garland Community Garden! March 12 Colby Clark is shown above turning the organic matter that will soon be home to numerous tomato plants. Colby, a Garland fireman and a member of Loving Garland Green was busy at work turning what will be home to about 25 tomato plants in front of the Garland Community Garden. Colby not only has tomatoes for his garden, he has 150 that will be ready for Loving Garland Green's Seedling Sale April 11 down at the garden. I hope you'll mark your calendar. The Children's Garden area at Garland Community Garden is growing and growing. . .
We hope this garden area will encourage children and their parents to use their imaginations and have fun together in their gardens. Lifelong happy memories with a parent or grandparent can be born in the garden. We are slowly moving out of the gardener's nether world of seed catalog dreams and into the reality of our garden. Last Saturday we added four containers to the Children's Garden. Now we have seven containers already growing plants: The three repurposed black containers contain perennial flowers--bearded irises, phlox and yarrow. The four bag containers feature carrots in the two rooster sacks and potatoes in the taller deer corn sacks. Our garden is not designed with a bunch of wooden sided, standard sized, raised beds--although these gardens with their uniformity have their own beauty. We have designed the Garland Community in a free style. Some of our garden areas are container gardens which range in diversity from a tall commercial planter with tulips (to come) to the feed sacks shown above which were purchased from a local feed and seed store for ten cents each and planted with edibles. The Children's Garden is a large somewhat square spiral. At its center we will feature a fairy house and garden. Two hybrid Celebrity tomatoes were added on March 11--even though we'll likely have to cover both of them with a five-gallon bucket prior to Easter. Vegetables and strawberries will also be planted in it soon. 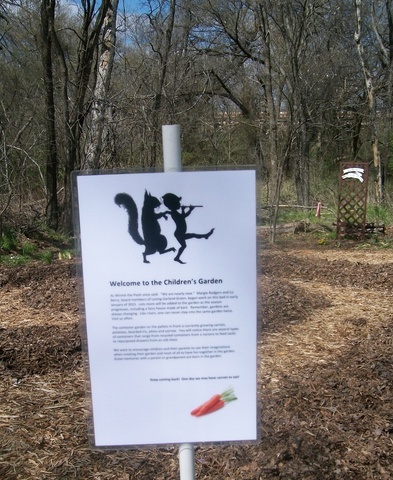 Small signs will tell the children about the various veggies. As each vegetable is ready for harvest we will have signs indicating the plan is ready to have its bounty picked and eaten. We limit these harvests to those under the age of 18. Other areas of our garden feature various popular garden formats such as two square foot gardens, a concrete block garden, a keyhole garden, and two plots made from a repurposed IBC tote. One very attractive bed was designed by one of our members, Nancy Lovett. She had a tree cut down at her home and cut the branches into approximate 12 inch high stumps which now enclose Nancy's bed. Most of the beds, however, have no border. These are the most inexpensive. 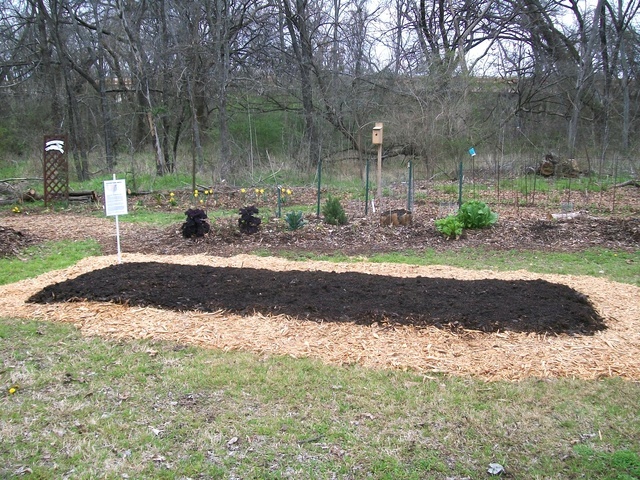 The soil in our beds is primarily created from brown and green organic matter that we have gathered and put on a sheet of cardboard we laid down to kill the grass. Just prior to planting we will add a three inch mixture of compost and garden soil. 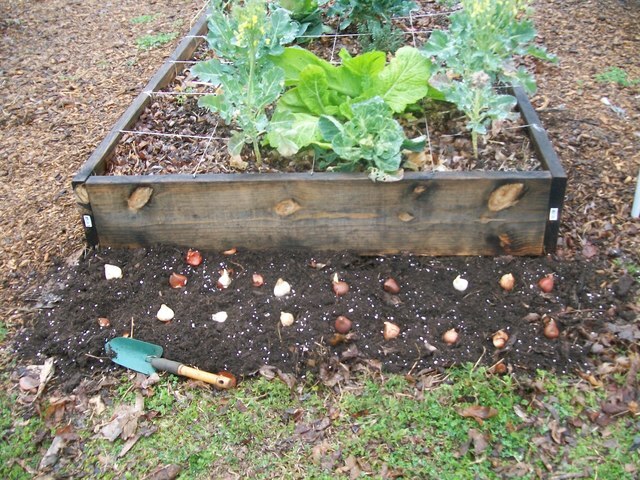 We want to demonstrate to the people who live in our community that if you are patient you can create a garden with "found organic matter" such as leaves and uncooked vegetable scraps, seeds and cuttings from your neighbors. 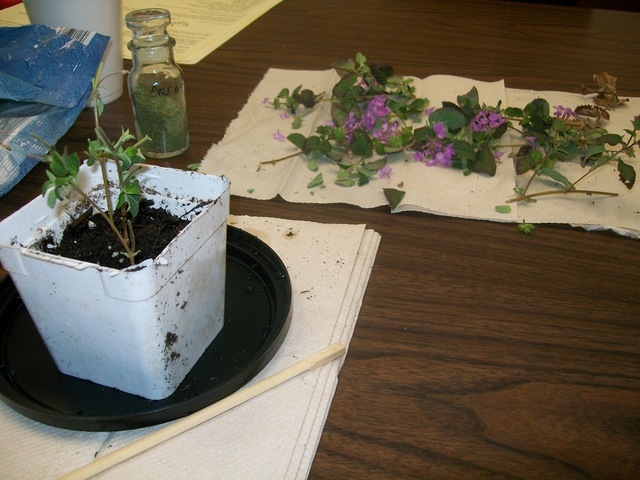 You don't have to be an "expert" although you can learn from the experts at the Master Gardeners Texas AgriLife site and classes. You can also learn from the experts you find at your local garden stores. For us in Garland that means Roach Feed and Seed and Rhodes. Also, our transported forest floor continues to expand. If you live in the Garland area and have bagged leaves, please drop them off at 4022 Naaman School Road. You can leave the bags by the compost bins. Also please save your veggie waste (those cut ends from fresh veggies and those fresh veggies you forgot about that are now wilted in your refrigerator). We now have two large green containers at the garden just waiting for them. We will use this organic matter for trench composting right in the beds. 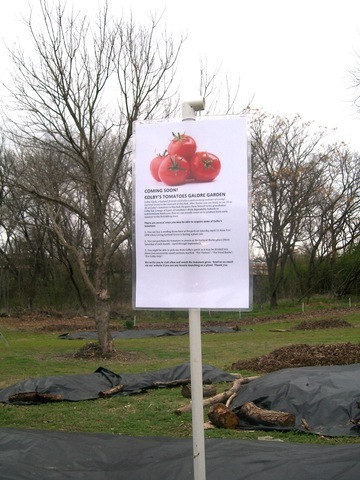 We are beginning to get our new signs posted in the garden. The one above announces the arrival of The Children's Garden. 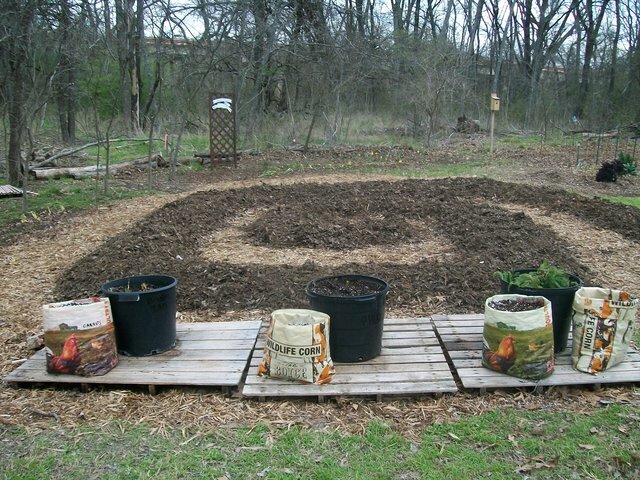 Yesterday we also added one that explains the Three Sister's Bed, the Medicine Wheel and another sign that explains how we make the soil at the Garland Community Garden. Can We Purchase Chokeberry Shrubs Locally? WHY DON'T WE HAVE PLANTS LIKE THIS FOR SALE IN OUR NURSERIES (OR DO WE?) AND WHY DON'T WE SEE EDIBLES LIKE THIS IN OUR GROCERY STORES? If I were queen of my own garden store I would limit most of my stock to native plants (and of these, most would be producers of edibles). I would provide enticing signage that would educate people regarding these plants and what to do with the edibles they produce. BUY CHOKEBERRY SHRUBS TODAY AND MAKE JAM IN THE FALL! With a Chokeberry shrub, you can have almost everything! The Chokeberry is a deciduous shrub that has everything: clusters of lovely spring blossoms that provide nectar for pollinators and beauty for the world; dense clusters of juicy red fruit (for birds, animals and people); and as a last gift of the year this lovely shrub produces lovely fall foliage. 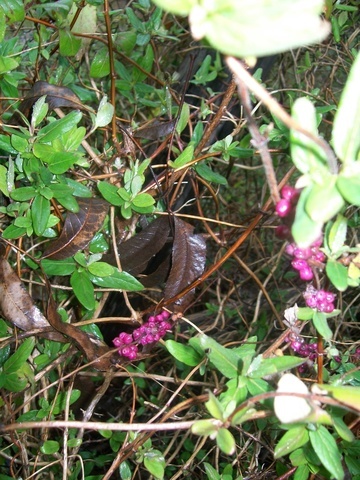 Chokeberry grows all over Texas as well as the southern and eastern USA. 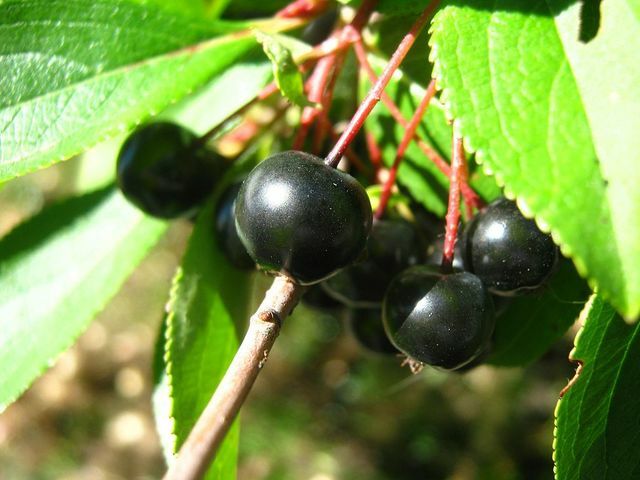 It is also known by many other names: Common Choke Cherry, Chokecherry, Wild Black Cherry, Cabinet Cherry, Rum Cherry, Whiskey Cherry, Black Chokeberry, Caupulin. According to Aggie Horticulture: "The white spring to early summer flowers are held on 3- to 6-inch dense cylindric racemes. They are followed by 1/4- to 1/3-inch-diameter juicy, thick-skinned, astringent and barely edible dark red fruit which ripens to dark purple or black." The berries are tart and bitter when eaten alone and thus "difficult to choke down"--hence the name. Well, why bother with chokeberries? Green Deane from Eat the Weeds answer that questions: ". . .a host of potential positive chemicals including blue Malvidin, Caffeic Acid (an anti-oxidant also found in wine) blue Delphinidin, dark red-purple Cyanidin-3-Galactoside, and Epicatechin, an anti-oxidant found in chocolate. We may not be able to pronounce them but they are anti-… anti-bacterial, anti-viral, anti-arterial plaque, anti-cholesterol, anti-cancer, anti-flu, anti-E coli, anti-high blood sugar, anti-herpes, anti-HIV, anti-Crohn’s Disease as well as improving insulin production while protecting the liver and the stomach. No toxic effects are reported and the genus is naturally pest resistant." Deane also tells us: "they can be made into jams, jellies, juice (by itself or blended) pies and other baked goods. They are also made into wine, stronger alcoholic beverages, pickles, flavoring for ice cream and yogurt and used as a natural food coloring. Among native Americans the Abnaki and Potawatomi ate them for food." Bring boiling-water canner, half full with water, to simmer. Wash jars and screw bands in hot soapy water; rinse with warm water. Crush chokeberries thoroughly, one layer at a time. Place chokeberries and water in medium saucepan. Bring to boil. Reduce heat to low; cover and simmer 20 minutes or until tender. Measure exactly 3 1/2 cups pulp into 6 or 8 qt saucepot. Stir in lemon juice. Stir pectin into prepared pulp in saucepot. Add butter to reduce foaming, if desired. Bring mixture to full rolling boil (a boil that doesn't stop bubbling when stirred) on high heat, stirring constantly. Stir in sugar. Return to full rolling boil and boil exactly 4 minutes, stirring constantly. Remove from heat. Skim off any foam with metal spoon. Ladle immediately into prepared jars, filling to within 1/8" of tops. Wipe jar rims and threads. Cover with 2 piece lids. Screw bands tightly. Place jars on elevated rack in canner. Lower rack into canner. (Water must cover jars by 1-2". Add boiling water, if necessary.) Cover; bring water to gentle boil. Process 10 minutes. Remove jars and place upright on towel to cool completely. After jars cool, check seals by pressing middle of lid with finger. (If lid springs back, lid is not sealed and refrigeration is necessary.). What do you do when it snows? I play in the snow with friends from Loving Garland Green down at the Garland Community Garden. Among other things, we were celebrating a state-wide award for Loving Garland Green from Keep Texas Beautiful that we just heard about yesterday. 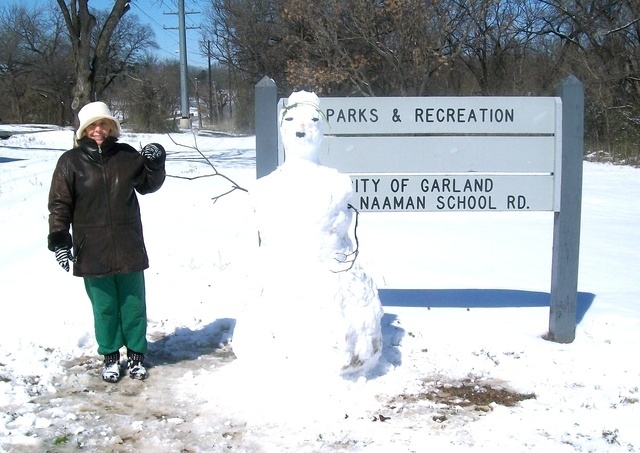 Anita Opel, treasurer of Loving Garland Green poses with the first snow person she ever made. (Having lived in Minnesota for over 1/3 of my life, I taught her all I know.) Our work of art is somewhat anatomically correct for a snow woman, given they have very thin arms. Later, after this photo was taken Anita got another creative burst and made a headband and necklace for our Lady of the Garden who will be here today and gone tomorrow. 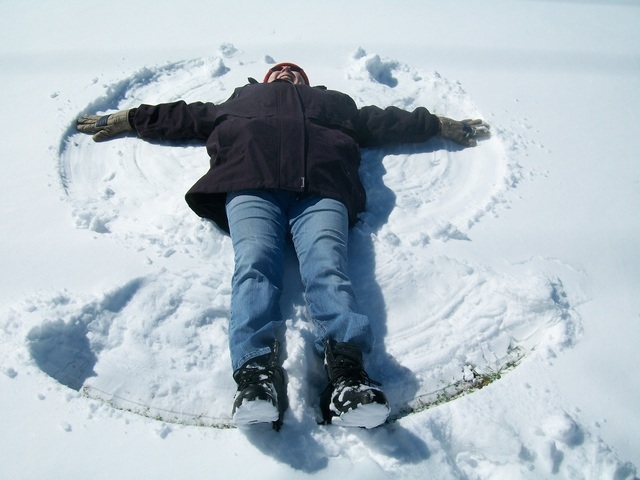 Margie Rodgers, Loving Garland Green Board member, makes a snow angel. The official measurement at the DFW airport is 3.4 inches. As far as my yard here in Green Garland is concerned: The official measurement is 4 inches. But what does this mean in terms of water for the garden? According to meteorologists: The snow to liquid equivalent is the amount of liquid precipitation produced after melting snow. The temperature profile of the troposphere (lowest layer of Earth's atmosphere and site of all weather on Earth)and the surface temperature are important factors that determine this value. The "average" snow to liquid ratio is 10:1. This is saying that if 10 inches of snow fell and that snow was melted it would produce 1 inch of liquid precipitation in the rain gauge. So this recent snowfall has yield just a little more than we would have gotten from a 1/4 inch rain. Thinking about weather extremes today, I was thinking that 2010 was our hottest summer, but my own research proved me wrong. Turns out the hottest year in our history so far has been 2011. Yep, summer 2011 is officially the second hottest on record for the United States and the hottest ever for Texas, Oklahoma, New Mexico and Louisiana, according to a release from the National Oceanic and Atmosphere Association (NOAA). Our own award-winning Keep Garland Beautiful chapter nominated us for this awared. Of the four awards, two are from the DFW area and two are from the Hill Country. As president of Loving Garland Green, I'm honored that our organization was chosen for this award. Look at the other winners and you'll see what I mean. Civic Organization Awards from Keep Texas Beautiful recognizes contributions by civic organizations that support the Keep Texas Beautiful mission. For almost a decade, the Lost Pines Chapter of the Texas Master Naturalist program has been training volunteers to help maintain the community's natural resources and preserve the unique beauty and character of the local environment. The Lost Pines chapter, was formed in 2000 to serve Bastrop and Caldwell counties. I rest my case for fun in the snow with one of Margie's yard art frogs! 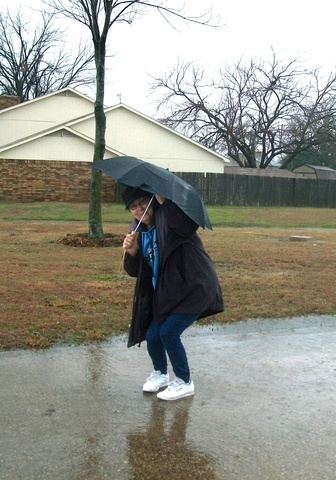 Another wonderful soggy day in the DFW area. Our trees are loving it! And so are the wildflowers. Speaking of wild flowers, if you or your friends are among those many Texans who are obsessed with Texas Bluebonnet photo ops with your children and grandchildren, there will soon be several acres with hundreds of thousands of them right here in Garland, just waiting for your spring 2015 collection of photos at Rosehill park--and what better background than a swath of Blackland Prairie. It's really going to be a beautiful sight. First from the road Country Club Road inland back in the direction of woods there is a swath of land about a quarter mile long and a city block deep there that will be a deep carpet of blue in a few weeks. Then another ribbon of land stretches along that same length back to the woods. That land contains grasses and plants native to the Blackland Prairie. Today Margie and I went in search of two locations that we've heard are examples of the Blackland Prairie right here in Garland. 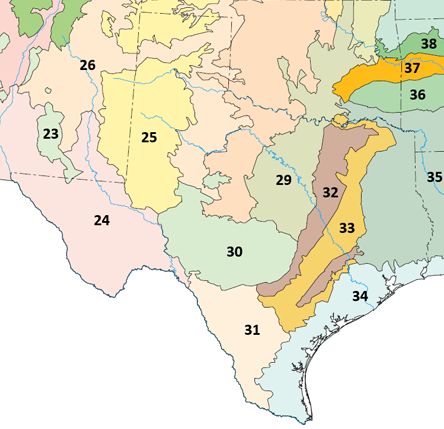 In case you don't know, the Blackland Prairie is an area that once stretched from the Red River on the north southwesterly to San Antonio and included most of the DFW area. Today estimates indicate that less than one percent of the Blackland Prairie remains--having succumbed to heavy agriculture and urbanization. This loss of native plants and habitat is substantial considering the area covers approximately 19,400 square miles. It was exciting to see this wide swath of Blackland Prairie here in Garland--made all the more exciting since Margie and I were standing out in thunder and rain, the tallest objects in the middle of a prairie. The thunder got fairly close so we returned to the car, but not before I took a few photos. Also we didn't want to walk too deeply into the prairie because we couldn't see any clearly defined trails and we did not want to disturb the plants. We'll return in drier weather to see if there is some clearly defined entrance to this area with trails. Here is Margie as we returned to where the car was parked (she was trying to lower her lightening profile)--today was not the day for the faint of heart to be walking about a prairie. I'm grateful for adventuresome friends like Margie who are willing to go on crazy spontaneous trips to visit the unknown with me. Gene, Margie's husband, who is known affectionately to me as "Mr. Margie" sometimes goes with us, but today was a little too soggy for him and he stayed home with his books and inventions. From Rosehill we drove northwest to Spring Creek Forest Preserve. This is a very special place--not only in Garland, not only in the state, but also in the world. Holford Road splits this preserve into two parts and there is an entrance and parking area on the west side of the road and also an entrance on the east side of the road. These two entrances are not directly across from each other and if you are driving too fast, you are likely to miss both of them. The side of the preserve on the east has a large pavilion and appears to be more developed as a park with picnic areas. The side of the preserve on the west is wilder and more natural although it does feature some benches. Today Margie and I tromped/slushed around down the muddy trails of the more untamed side of the preserve. We did drive into the eastern side as we were leaving the area, but it was raining with such enthusiasm by that time that we declined to get out of the car. The Spring Creek Forest Preserve contains a virgin forest that is extremely rare to find in any urban area in the world. A virgin forest is a forest that has attained great age without significant disturbance and thereby exhibits unique ecological features and might be classified as a climax community (a historic term that expressed a biological community of plants and animals and fungi which, through the process of ecological succession the development of vegetation in an area over time, had reached a steady state. This equilibrium was thought to occur because the climax community is composed of species best adapted to average conditions in that area.) Old-growth forests or virgin forests are often biologically diverse, and home to many rare species, threatened species, and endangered species of plants and animals. 1988, Dallas County and the State of Texas purchased 69 acres of the land to set aside as the Spring Creek Forest Preserve. The land was given to Garland for maintenance. 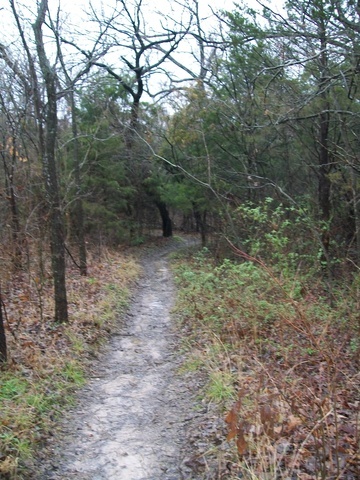 Since 1987, the City of Garland and the Preservation Society for Spring Creek Forest are responsible for maintaining the nature trails within the Preserve. It is a very special place. This preserve also features a gentle, wide spring water stream that flows over a bed of solid limestone. 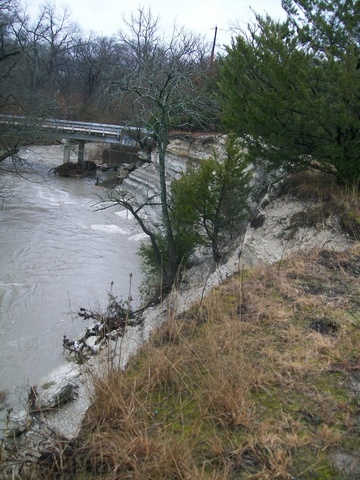 The force of the water has cut cliffs from the surrounding Austin Chalk. The towering 20- to 40-foot-tall (6 to 12 m) cliffs contain Cretaceous fossils dated at 87 million years old, a combination primarily found only in Garland. 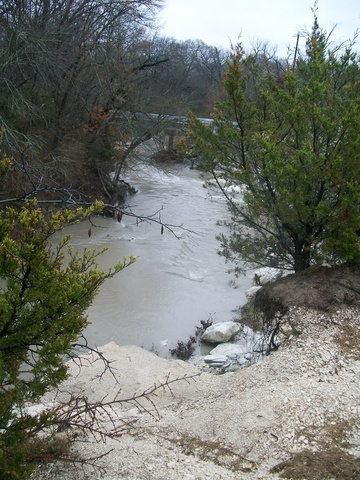 The entire length of Spring Creek, is spring fed at a constant 72°F. The swift flowing water varies in depth between one and six feet and is about 20 feet wide. It has never run dry--even in years of extreme drought. The water is so clear that one can see the native Longear Sunfish gliding along against the white, limestone bottom. It is this abundant water supply that has allowed the forest to survive for centuries. This place is indeed a very precious natural location on our planet. And to think: This is our neighborhood! This is Garland and one more reason why I love Garland green and want to continue to grow it in that direction. 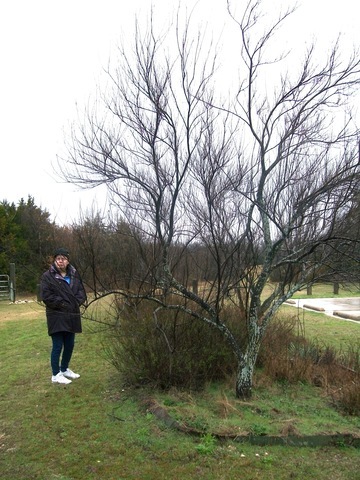 Margie standing beside a small demonstration garden of a Blackland Prairie. Adjacent to the parking lot at the Spring Creek Forest Preserve there is a small demonstration garden of a Blackland Prairie. In addition to native grasses, shrubs and plants such as the Yucca, it also contains two trees. I have no idea what these trees are and I'm counting on someone to enlighten me. I don't think I've ever seen one before The branches are somewhat like that of a willow. 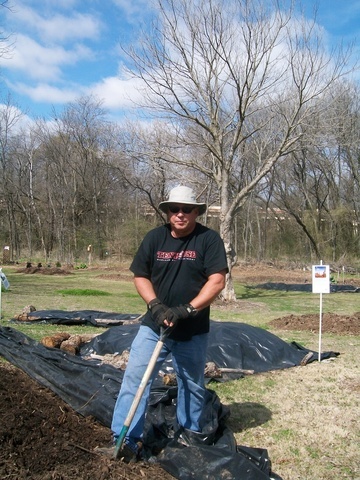 This demonstration garden of a Blackland Prairie is similar to the one that we will be installing at the Garland Community Garden in a few weeks. However, we don't plan to have trees in our plot. The one shown above was created by the Garland branch of the Native Plant Society of Texas. [I don't know if the Garland Branch is active or not. Their website states they have no meeting scheduled for 2015.] However, the Native Plant Society of Texas is still quite viable. March 4, 2015 - Starting out down the trail into the Spring Creek Forest Preserve--perhaps the land of Hobbits and fairies, a few gnomes and perhaps a troll or two? March 4, 2015 - Beside the trail in Spring Creek Forest Preserve - What are these berries and are they edible? March 4, 2015 - The beautiful Spring Creek. 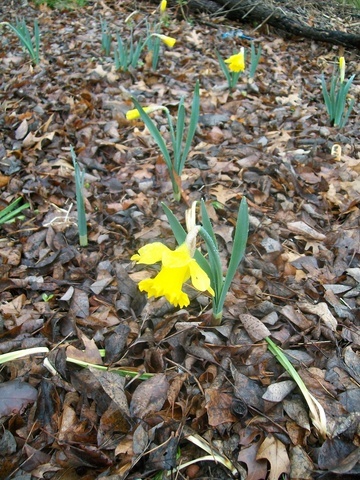 In the back of Garland Community Garden near the Children's Garden the jonquils bloom bring the promise of warmer times--some day. Today was an all day work-in-the-garden day. It began at 7 am in the Garland Community Garden where I planted about 60 tulip bulbs--25 of them in a large black pot I also installed this morning in the garden. In 3 or 4 weeks we will see tulips in the black container and in front of both the square foot beds too. Then, just as I was about to leave to work in another Garland Garden, Gregory from the Garland Environmental Services stopped by to deliver two green trash containers. These containers are the first step in our plans to collect uncooked vegetable scraps from the citizens of Garland and also from one of our local grocers. Now we have a safe and sanitary place to store them prior to using them in compost trenches in the beds. By the way, please continue to drop off your bags of leaves as we can always use them in the garden. The City of Garland delivers as promised. 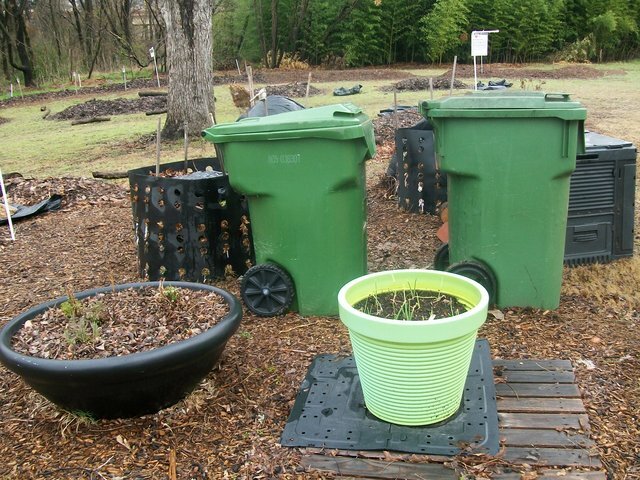 Now the Garland Community Garden has two great storage bins for vegetable waste. 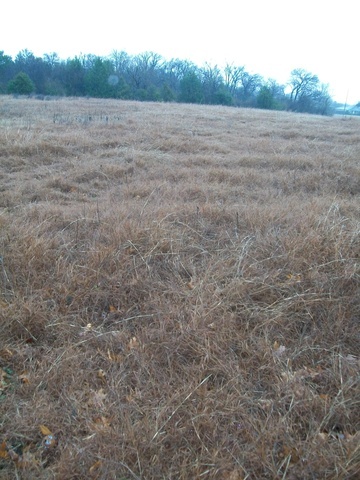 Other plans for the week include installation of the Buffalo Grass test lawn and the Blackland Prairie demonstration plot. We have decided to make the Buffalo Grass plot a participatory site. We will, of course, have a sign providing information about the plot. We also plan to include a clip board and pen for visitors to write comments regarding what they think of the grass. 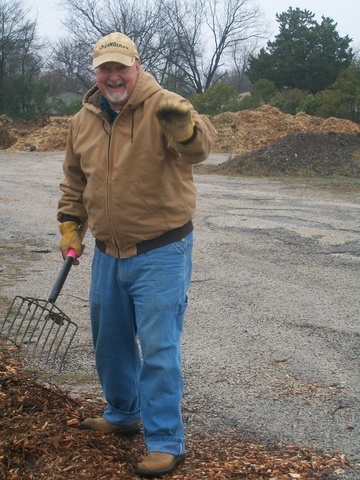 By the time I arrived at the other Garland Garden I was a soggy mess looking more or less like something creek possums had drug up, but I don't think my Master Gardener friends minded as we all know what a difference an extra pair of hands can make--even if they are already dirty. 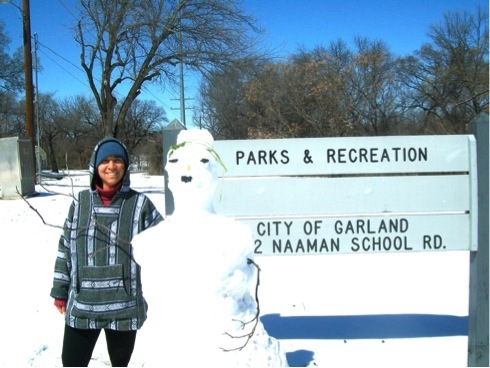 Garland is in the process of creating yet another unique public garden site and I'm happy to say that I'm a member of the team who is building it. As far as I'm concerned, this one makes the fourth one that I'm aware of in our city in terms of garden or agricultural spaces that seek to educate the public: 1) Spring Creek Forest Preserve 2) Rosehill Park 3) Garland Community Garden and 4) The Texas A&M AgriLife Extension Service Dallas County Master Gardeners and the host organization of this site which is located on Rowlett Road about a mile east of Broadway. Currently this site is under construction and not open to the public. We are "nearly new and hardly begun", but I'll keep you posted on our work as we progress. It's a remarkable project and I'm honored to be associated with it. Our work today was spreading mulch and making sure to steer clear of the large beehive found in a nearby shed shown in the photo below. A local beekeeper has been contacted and we will have the hive moved to another location on the property. Linda Barnes -- Queen of the Tree Stump removers and also a certified Master Gardener. 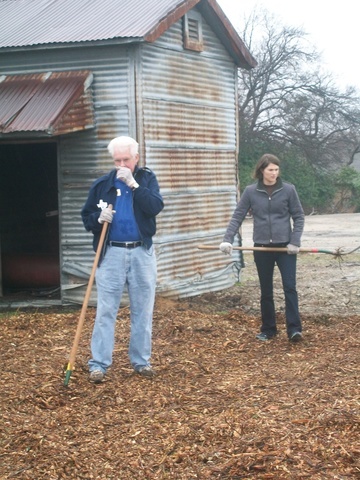 Dudley Hargrove, President of the Dallas County Master Gardeners, takes a break to scratch his nose while Cassie continues to work. At lunch time Cassie and I, both interns, got a lesson in plant propagation from Linda. We started about 10 about ten plants each. All in all it was another wonderful soggy day in paradise.